It is painful and unbelievable that we are approaching the one year mark since Boko Haram abducted our girls from their school in Chibok. Many more fellow Nigerians were abducted before and after. So many have lost their lives, and we have millions of IDPs and refugees. 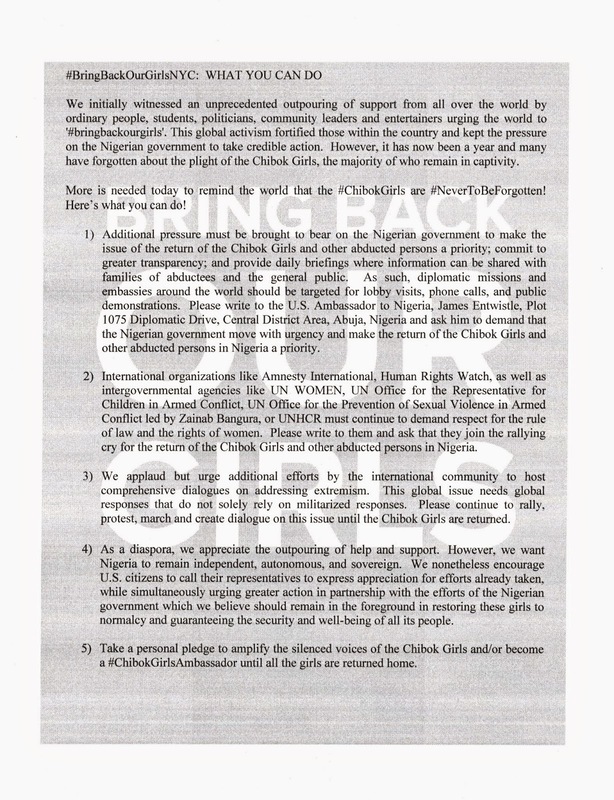 Despite the devastating circumstances, we remain steadfastly hopeful that the Federal Government of Nigeria (FGN) would collaborate with the governments of Chad, Niger and Cameroon as well as other African states and international partners to rescue our abducted girls and fellow citizens and reunite them with their families. The FGN has a huge responsibility: Besides ensuring that our girls and fellow citizens are rescued, IDPs must be given decent humanitarian assistance according to established best practices. Refugees must also be given thoroughgoing protection, decent conditions and humanitarian assistance according to established best practices. Communities that have been devastated must be rehabilitated. Our country also needs healing and an end to the atrocities fostered by Boko Haram. 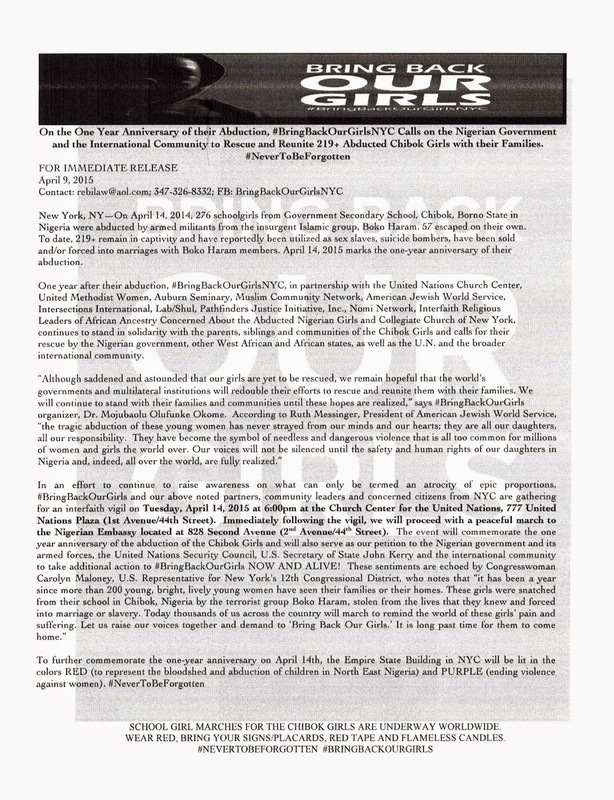 Sadly, #BringBackOurGirls will commemorate one year of our girls' abduction on April 14. Nevertheless we stand firm in our hope for their rescue and and reunification with their families. We encourage the FGN to begin making plans for the best psychosocial support for our girls, their families and communities, so they can resume their education and lives. 1.NEW YORK—On April 13 at 11:00am Congresswoman Carolyn B. Maloney (NY-12), Ambassador of Surinam to the UN Henry MacDonald, Minister of Counter Terrorism of the Permanent Mission of Nigeria to the United Nations Lawal Mohammed Hamidu, City Councilmember Ben Kallos (District 5), Assemblymember Rebecca Seawright (76AD), human rights leaders and activists, a group of High School students, members of the NGO Committee on Sustainable Development, and the #BringBackOurGirls advocacy organization will gather at Dag Hammarskjold Plaza to commemorate the 1-year anniversary of the kidnapping of 276 girls from their school in Chibok, Nigeria by Boko Haram. 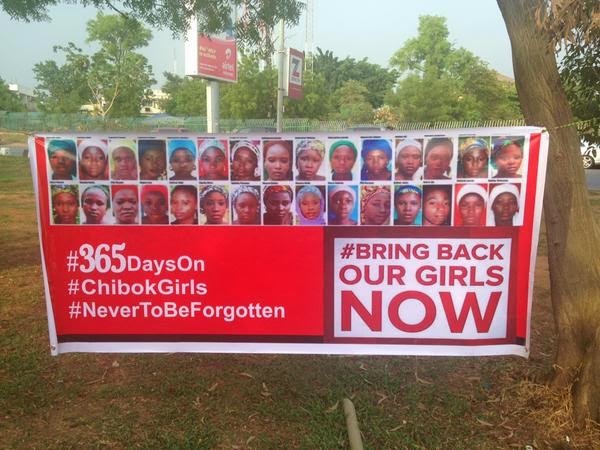 Although some of the girls managed to escape captivity, 219 of them are still missing. Maloney will also announce that the Empire State building will be lit in purple and red on April 14th in recognition of the need to locate the girls and return them to their families. Maloney and advocates will call for a vigorous international effort to find the girls, along with a full investigation to determine if some of the girls may have been among those murdered last month by fleeing Boko Haram soldiers. As a gesture of solidarity with the Chibok Girls, the High School students in attendance will tie 219 ribbons around trees and railings. One ribbon for each of the girls still missing. Attendees are asked to wear red (official color of #BringBackOurGirls) or purple (official color of Stop Violence Against Women). 4. A Rally at Nigeria House. 5. Procession to Empire State Building to see the lights.